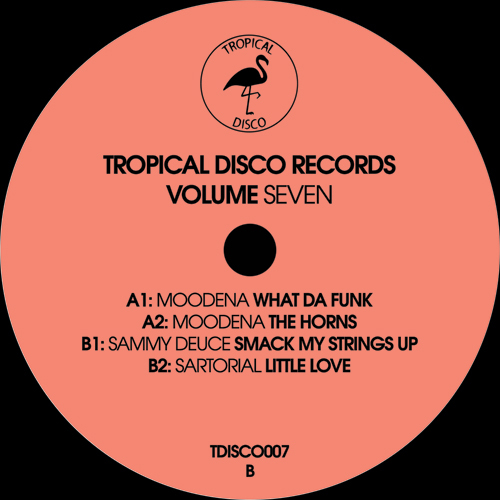 Tropical Disco plucks out a spellbinding salvo of heaters for Tropical Disco Volume. 7, dished out on suitably heavy wax. Moodeena’s “The Horns” boldly kicks off the record, effortlessly weaving together elements of funk, soul and afro, influenced by a myriad of far-reaching regions. The earworm of a bassline subtly leads the piece, morphing, dipping and then reassembling as the brass resurfaces, creating a tender, palpable sound palette. On the flip “What Da Funk”s playful track title doesn’t reflect its cultivated build, and no doubt lethal functionality on a dancefloor. Titillating strings are the driving force for Tropical Disco newcomer Sammy Deuce’s input, bringing a burning, high-energy ode to golden-era disco with “Smack My Strings Up”. Hot on the heels of a series of well received releases on labels such as Glasgow Underground, Club Session and Big Love, Sammy deuce offers up a rare guest track on the label that pairs perfectly with a recipe Sartorial and Moodena have refined so successfully. Tropical Disco’s back-catalogue of quality nu-disco obscurities is building thick and fast, and the latest package is a diamond in a gleaming gold mine.